Peter LaBerge was a commended Foyle Young Poet in 2012. He founded the internationally renowned poetry magazine The Adroit Journal, offering opportunities and prizes to young poets across the USA and the globe – and has also published two chapbooks himself. In this seventh Foyle Friday feature, Peter is interviewed by Foyle Young Poet Margot Armbruster, who was a top 15 winner in 2017 and is herself an alumna of The Adroit Journal’s Summer Mentorship Program. They speak about the Foyle Young Poets of the Year Award, Adroit, and the difficulties of balancing writing, editing a journal and life. What did it mean to you for your poetry to be acknowledged in an international competition at a young age? Oh, it was the best feeling! I spent the prior year reading and re-reading the works of the previous Foyle Young Poets winners – Phoebe Stuckes, Emma Townley-Smith, Ameerah Arjanee, Sara Henry, and many more – and wanted my work to participate in a conversation of sorts with these and other poets. I was absolutely windswept upon hearing the news, and remain so grateful that I was offered a chance to participate in that conversation when I was! Being recognised in the Foyle Award absolutely boosted my confidence in my writing, but one of the best outcomes of my Foyle commendation was making friends with a group of enormously talented people. Writing is often a solitary endeavour, but being able to reach out to these brilliant poets for advice, feedback, or reading recommendations has been invaluable. How did your commendation affect your writing? Did it change anything about your editing processes? 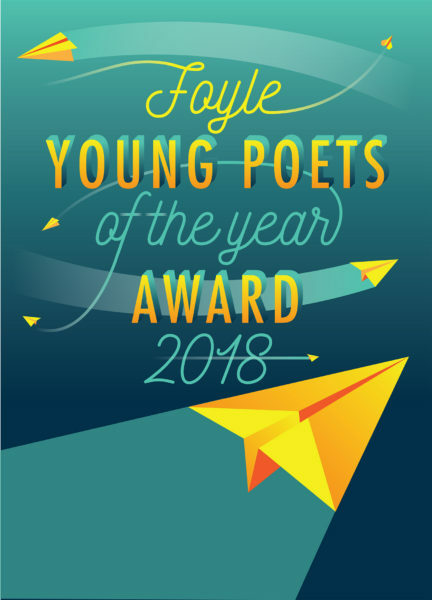 When I was recognised by the Foyle Young Poets of the Year Award, I was on a precipice of sorts – I was really starting to let my authentic self shine through in my writing. At the time, I wasn’t out to my family and I was very apprehensive about being a publicly queer writer at this phase of life. Even though ‘Desires’, the poem that was commended in 2012, doesn’t mention queerness by name, it was one of the most honest (and therefore, in my mind, one of the most queer) poems I’d written. Ultimately, Foyle encouraged me to take more thematic and stylistic risks in my work, and at the same – in recognising one of the few poems that I felt was queer – showed me that it was foolish to view honesty as a radical thematic or stylistic risk. It was silly to try and write about anyone or anything other than myself – even through the persona poems I’d later write for my chapbook Makeshift Cathedral, I could write about myself in satisfying, evocative, and honest ways. Foyle also radically affected the process of editing The Adroit Journal, albeit more topically. I got to know a number of other Foyle writers with whom I was recognised in 2012 – one of them, Sarah Fletcher, was ultimately the journal’s first Managing Editor! What aspects of your own experience as a young writer informed your decision to start The Adroit Journal? Honestly, I was frustrated with the impersonality associated with being an emerging writer – the form rejections, the anonymity in the face of niche icons, the futility I felt when all the passion and energy I could muster yielded rejection after rejection from publications like Poetry, The New Yorker, and so on. I can’t speak on behalf of the education system in the United Kingdom, but the American education system places a tremendous amount of emphasis on STEM at the expense of attention to creativity and the arts. It felt incredibly foolish to me that nobody was leveraging the Internet as a tool for connecting living, breathing writers with teenagers who were simultaneously passionate about the art of writing and being discouraged from pursuing it at every turn. Given this impetus for starting a publication of my own, providing a space for young writers to gain this exposure has remained near and dear to the journal’s metaphorical heart. 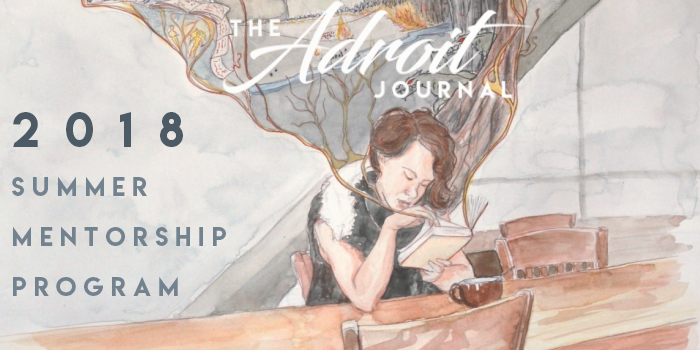 The Adroit Journal, issue twenty-five. Cover art by Brian Oldham. 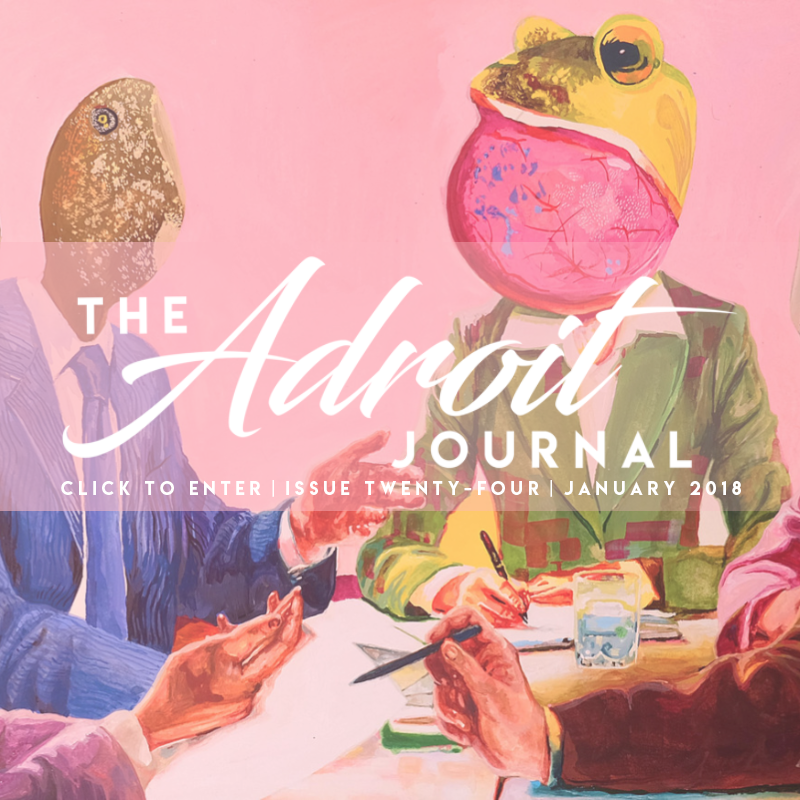 The Adroit Journal, issue twenty-four. Cover art by Nayeon Clara Hong. What obstacles were the hardest to overcome at the beginning of Adroit’s development? Was it harder to earn respect from older writers or to take yourself seriously? To begin, there was no model for starting a literary publication as a teenager outside of the Academy and the literary establishment. At the time, the overwhelming majority of publications were university-affiliated, and had been in operation for decades (at least). I had to learn how to run a publication and be a literary community advocate while on the job, through trial-and-error. While there were occasional snags in web and issue design, submission policies, and more, I’m also glad I wasn’t tainted by certain literary customs – we never got into bad practices like accepting subpar work from solicited writers. 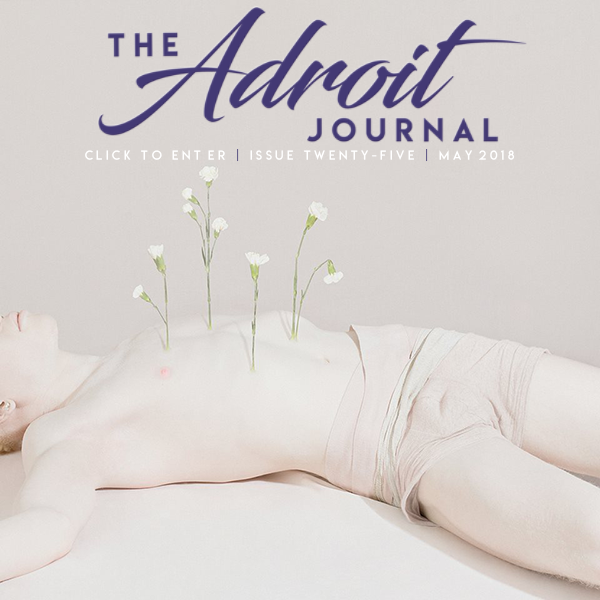 Anyway, the point is: founding and developing The Adroit Journal was difficult in the early days because I had no experience or industry knowledge, and because I was young, effectively unpublished, and it was therefore very easy not to take the journal seriously. What it took to succeed, above all else, was soliciting a ton of writers I admired – I got lots of ‘no’s (or, even worse, silence), but every once in a while I got a yes. That, together with some excellent unsolicited work from intrigued poets and writers, set us up for a strong first issue that got the journal started on the right foot. Which literary initiative (either within or outside of Adroit) are you most proud of? I’m definitely most proud of the annual Adroit Journal Summer Mentorship Program. I founded the Program back in the summer of 2013 – I’d just graduated from high school, and realised that what I’d really sought out all throughout high school had been direct communication with some of my favourite writers out there today. When I decided to impulsively reach out to some of these writers (among them, Matthew Nienow and Chloe Honum), I was shocked to hear that they were more than willing to spend time with my work, explaining vital concepts like importance of conscious lineation and the dangers of overcooked abstraction. My immediate impulse, after recognising the tremendously beneficial effect that Chloe, Matt, and similarly generous writers had on my writing, was to create a way to extend and spring-load these critical craft conversions while also scaling them, so as many students could take advantage of them as possible. I also, of course, am tremendously proud of the issues I’ve produced, and the writers I’ve had the privilege of featuring. What a gift it’s been – the journal has truly grown far beyond even my wildest expectations. Knowing what you do now, what advice would you give to your high-school-sophomore self? I would caution myself from embracing the writing habits I could identify at that stage – among them, writing without concern for narrative cohesion and openly embracing abstraction. I fully believe that writing growth happens most when we challenge what we think we know – about others’ writing, but also about our own. Which authors and publications most influenced you as you were beginning to write seriously? Too many to list! But here are a few writers: Ocean Vuong, Chloe Honum, Richie Hofmann, Tarfia Faizullah, Bruce Snider, Terrance Hayes, Talin Tahajian, Claudia Cortese, Alex Dimitrov, and many, many more. To supplement that list, here are some of the first publications with which I fell in love: AGNI Online, Best New Poets, Black Warrior Review, Blackbird, Guernica, Indiana Review, Kenyon Review Online, Linebreak, Salt Hill, and many, many more. That’s honestly just skimming the surface. One of my favourite things to do is suggest new poems left and right. How has postgraduate adult life shaped your writing habits? How do you make time to write? Oh, what a question. The short version of this answer is that finding time to write as a post-grad working professional is incredibly difficult. The longer version of this answer is that I think the ability to find and make time to write as a working professional depends on two main factors: your writing style and the relationship between creativity and your day job. 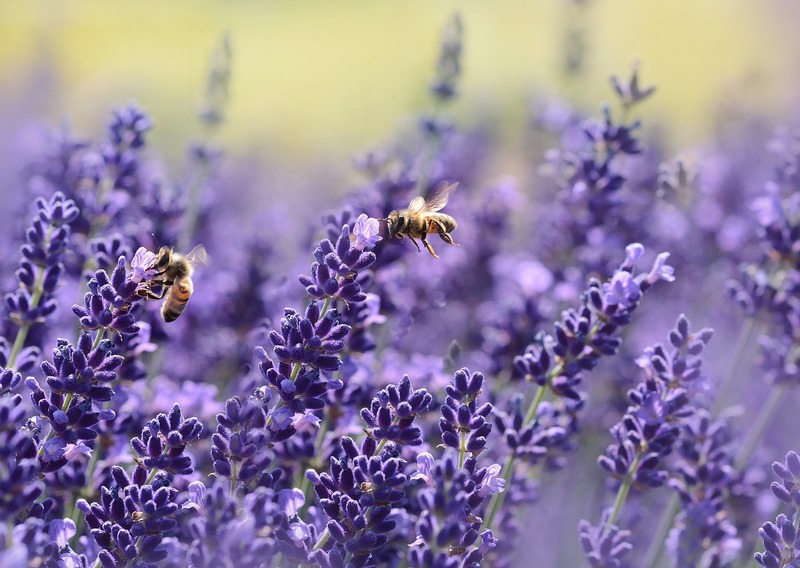 Some people, I think, function best when they can enter a new mind-set as they approach the practice of writing – separating writing from work preserves it in some form. Alternatively, I’ve known other people who thrive when their work is in direct conversation with their job. Personally, I think I (and most writers) fall somewhere between these two extremes. The overwhelming majority of my creative energy is funnelled directly into the expansion of The Adroit Journal, however. I don’t know how full-time publishers find time to write, personally! I’m still navigating that balance – between my fast-paced Silicon Valley marketing day-gig, my expanding editorial duties with the journal, my writing ideas and endeavours, and (of course) time to live life. The good news, of course (knock on wood), is that I’ve got a good bit of time to figure it out. How do you negotiate Adroit’s role as a publication which publishes predominantly established writers but also makes an effort to support emerging artists? This has been an extremely delicate balance, and a tough one to navigate! Thankfully, Adroit has been fortunate enough to receive truly fantastic submissions from established and emerging writers alike. Considerations of authorial intent and authenticity aside, we aim to be largely meritocratic as an editorial team. This has been known to occasionally result in rejecting three-time National Endowment for the Arts grant recipients in favour of fantastic teen writers writing far beyond their years. We’ve also, of course, put measures in place to allow our mission to expand even amidst a rapid decrease in acceptance rate – namely, our Greg Djanikian Scholars Program, our Adroit Prizes for Poetry and Prose, and our aforementioned free, online summer mentorship program for writers in secondary and high school. 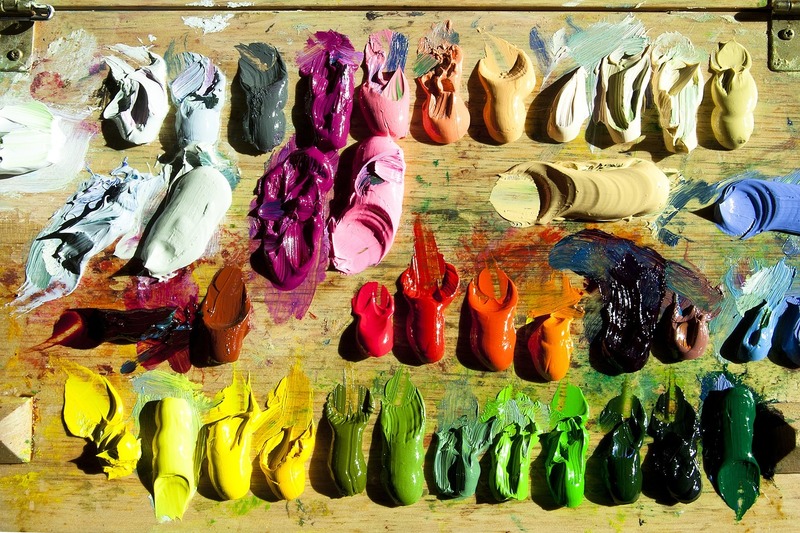 What’s the source of your creative inspiration? What disciplines do you think most readily interact with literature? The source of my creative inspiration definitely depends on my current project. For instance, when I was drafting the poems that would ultimately encompass Makeshift Cathedral, I drew a lot of inspiration from crime articles and nonfiction crime shows that involved LGBT+ victims or survivors. Alternatively, I’ve also written a sequence of poems after Lana Del Rey’s Born to Die album. I’ve also written some poems here and there in response to contemporary news events. I also have a number of poems that have been written in response to modern dance clips on YouTube. In general, I view composing and reading writing as a bodily experience. The best poems are felt in the body long before pen is put to paper. Each of these disciplines definitely has a special place on my inspiration palette – I think it’s about deciding what the project wants to be and achieve, and figuring out which of those disciplines (or another discipline entirely!) will help me drive the poems in that direction. What do you think the arts have to offer in today’s divided world? What don’t they have to offer in today’s divided world?! At their best, the arts offer a way for anyone – everyone – to witness the inherent humanity within objectified identities. This day and age’s news (and, by extension, world) consumption is plagued by confirmation bias – people are selectively receptive to political news and opinions that agree with their worldviews. Art, however, is more difficult to parse at the on-set. Those who’d refute – or even disregard – a work of art’s message if shared as a political op-ed may find themselves smack in the middle of its sensation. Entering the Foyle Award in 2017, I didn’t expect recognition of any kind, so I was thrilled not just to win the award, but to tap into the incredible support network Young Poets Network provides. There’s nothing to lose, and plenty (free books, chocolate, friends, and more…) to gain. 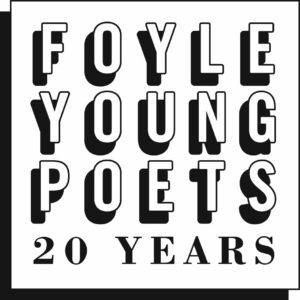 What would you say to someone thinking about entering the Foyle Young Poets of the Year Award now? I have advice that I always give to young writers submitting to contests: expect the worst, hope for the best. The Poetry Society is a wonderful, necessary organisation, and I love to see the effects of the work they do to support student writers from around the world. The key to maintaining a healthy mind-set amidst the (frankly, unhealthily competitive) world of high school writing is remembering that no literary organisations and no literary publications exist to discourage writers from pursuing the craft. Alternatively, these organisations and publications exist to encourage as many writers as they possibly can, which unfortunately happens to be far fewer than the amount that apply for or submit to the opportunities, most of the time. Peter LaBerge is the author of the chapbooks Makeshift Cathedral (YesYes Books, 2017) and Hook (Sibling Rivalry Press, 2015). His recent work appears in Best New Poets, Crazyhorse, Harvard Review, Iowa Review, Kenyon Review Online, Pleiades, Tin House, and elsewhere. He is the founder and editor-in-chief of the Adroit Journal and the founder of the Adroit Journal Summer Mentorship Program, and graduated from the University of Pennsylvania with his B.A. in English last year. 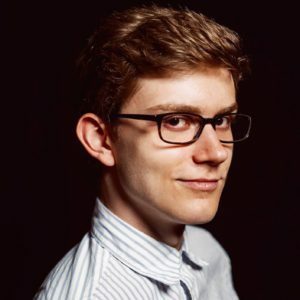 He lives in the San Francisco Bay Area, where he works in content marketing for a startup. Margot Armbruster is an 18-year-old poet from Wisconsin. Her work has appeared in The Guardian, DIALOGIST, and Rust + Moth, among other publications. She has been recognized by The Poetry Society as a Foyle Young Poet of the Year, by Princeton University, and by the Alliance for Young Writers and Artists. 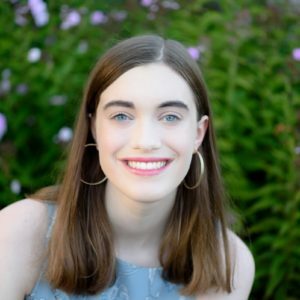 She is an alumna of The Adroit Journal’s Summer Mentorship Program and the Iowa Young Writers Studio, and, beginning in the fall, will study at Duke University as an Angier B. Duke Scholar.